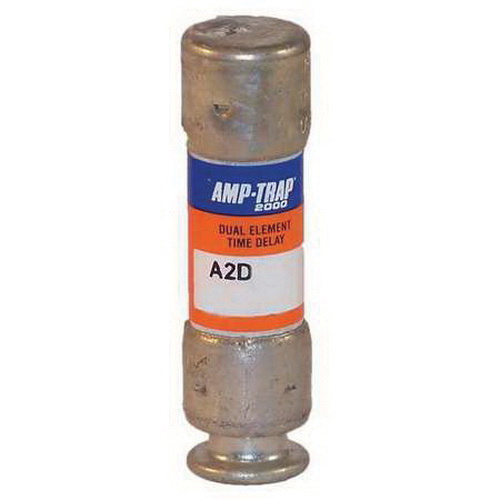 Mersen Amp-Trap 2000® A2D-R Series Dual-element rejection current-limiting time-delay fuse is rated at 40-Amps and 250-Volt AC/DC. This RK1 class fuse has ferrule terminal connection and cylindrical body style. The interrupt rating of this fuse is 200-Kilo-Amps at 250-Volt AC, 100-Kilo-Amps at 250-Volt DC and 300-Kilo-Amps at 250-Volt AC self-certified. It has dimensions of 13/16-Inch Dia x 3-Inch. The indicating fuse with clip mounting, features polyester construction and tin-plated copper contacts. This orange color-coded fuse is suitable for motors, safety switches, transformers, branch-circuit protection, disconnects, control panels and all general-purpose circuits. It limits current for low peak let-thru current. The high-grade silica filler offers fast arc quenching. Fuse is UL/DC listed and CSA certified.